Both products are available in Boots and Superdrug, although St.Tropez isn't available in smaller stores. 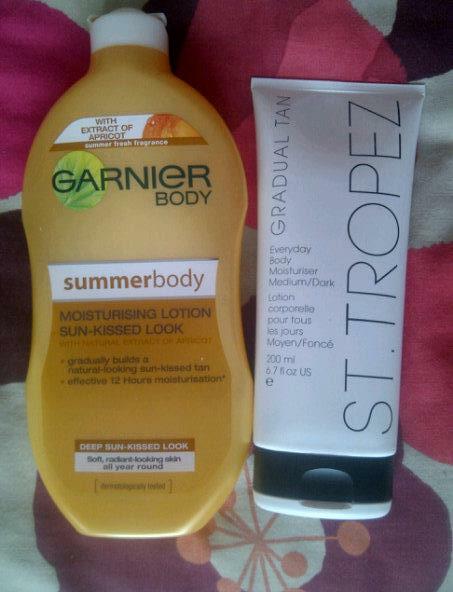 St.Tropez comes in at a very pricey £14.39 for 200ml, whereas Garnier would only set you back a tiny £3.58 per 200ml. I quite enjoy the shape of the Garnier bottle and it does have a nice fresh look about it, however there is no denying that St.Tropez looks a great deal more sleek and classy and is the sort of bottle you want to have out on display. Application of both is incredibly easy as you apply them like a normal moisturiser and don't have to use a mitt. However the application of St.Tropez seems to leave me with slightly orangey hands if I don't properly scrub them, whereas you can get away with a light rinse or wipe on a towel after applying Garnier and Garnier also seems to glide on better and dry more quickly. 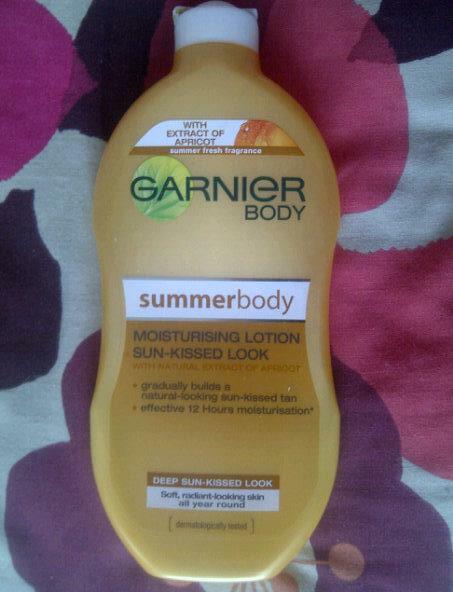 I don't just want the lotions to tan, but also moisturise and Garnier definitely does this better as it feels silky on the skin and blends in beautifully, providing me with the all day moisture it claims to deliver. 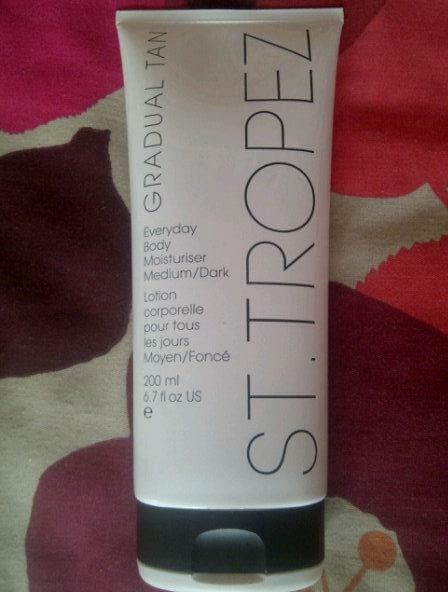 St.Tropez on the other hand feels thicker and harder to blend in so consequently doesn't feel quite as moisturising. Both products claim to have got rid of that biscuty fake tan scent and I'm afraid to say both of them lie! St.Tropez smells like they've mixed it with a bottle of perfume and Garnier's 'summer fresh fragrance with extract of Apricot' certainly has digestive undertones. However, they are both much better than Johnson's holiday skin which smells like it was made at Mcvities and I find that if I apply them before bed they get a chance to develop and I can just shower off the smell in the morning. I have both the lotions in the darkest versions as I find that you don't really notice much difference at all with lighter ones and I'm really impressed by the colour pay off of both. However, I think the Garnier one takes more applications to achieve a good colour, whereas the St.Tropez one has such an incredible colour pay off that you can notice the difference after just one or two applications and easily build it up to the same colour you'd get with an instant fake tan. It is not only the amount of colour you achieve that's important, but also the actual shade. Both lotions do well in this round as they create very nice natural golden tans with green olive undertones that ensures you avoid the orange TOWIE look or fake look, however St.Tropez wins as the shade is deeper. I imagine that to achieve perfect even coverage from both you should ex foliate before applying them, however I don't want to be constantly ex foliating so it's lucky that the coverage of both is pretty nice and even, although because St.Tropez is darker this makes patchiness on places like the neck and chest and product build up on dry areas more noticeable. Depending what I'm doing I'd say I apply these on average every other night to every two nights so I haven't really given them chance to properly fade, but as St.Tropez is darker it certainly lasts longer and requires fewer applications. So although St.Tropez has incredible colour pay off, Garnier pips it to the post with it's amazing price and great usability. Although I think using a combination of the two is perfect as it still allows you to save money, whilst getting a deeper more instant tan. Are you a fan of gradual tanners? Have you tried these two or do you have other ones to recommend? I loved Garnier;s but it just took too long to develop. As I'm really pale I had gotten the light version worried the darker would look silly and streaky. I'll definitely be giving it a go now though! I've not tried the Garnier one before! This is a fantastic review I love how you organized it!! Hi what a great review, i love the whole splurg vs save concept. I too love this granier gradual tan. I have just done a review on this product myself; check out the link below if u fancy a read.